On Aug. 21, the moon will pass between the Earth and the sun, casting a shadow that will race across the heartland of America at some 1,500 mph, moving over 14 states from Oregon to South Carolina as the United States experiences its first total eclipse of the sun since 1979 and the first coast-to-coast eclipse in 99 years. More than 200 million people live within a one-day drive of the 70-mile-wide path of totality, officials said Wednesday, which will carry the moon's shadow across hundreds of towns and cities and 20 national parks where record crowds are expected. Researchers said it may be the most watched, best observed solar eclipse in history. Passing over Salem, Oregon, around 1:15 p.m. EDT, the moon's shadow will race across Idaho Falls, Casper, Wyoming, most of Kansas City and parts of St. Louis before passing over Nashville -- the largest city directly in the path of totality -- and then darkening the sky over Greenville, Columbia and Charleston, South Carolina. The central shadow will move out over the Atlantic Ocean around 2:48 p.m.
NASA has posted a variety of maps, animations and videos showing the path of the eclipse, including a zoomable pdf and an interactive map showing when the eclipse begins, reaches maximum and ends for any point in the nation. It also shows the duration of the eclipse for each location in the path of totality. "This is a really amazing chance to just open the public's eyes to wonder, and to get people thinking about the most amazing natural phenomenon that happens on the surface of the Earth, a total solar eclipse, and to incorporate that into thinking about what's going on in our cosmos," said Angela Des Jardins, a researcher at Montana State University. Added Linda Shore, executive director of the Astronomical Society of the Pacific: "Astronomy is a very democratic science. The same laboratory that arches over the sky for scientists is the same sky that is available to everybody." "This is an opportunity to engage the citizenry in an incredible event that has shaped humanity for thousands of years," she said. "If we can encourage more people to get into space science and astronomy, that's fabulous. But if what we do is excite people about science in general, that's fabulous, too." 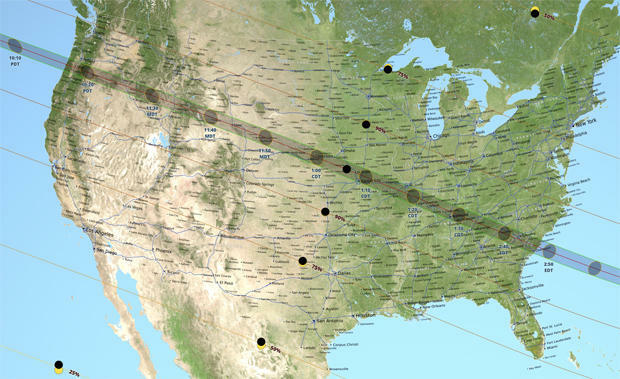 For viewers as far from the path of totality as San Diego, for example, the moon will cover 57 percent of the sun at maximum, slightly more in El Paso, Texas, and slightly less in Brownsville. Viewers in Key West, Fla., can expect to see a 71 percent eclipse, the same as in the New York City area. Viewers in Chicago can expect an 87 percent eclipse, 54 percent as far north as Bangor, Maine. "There are many, many, many millions of people who are not going to get to the path of totality because of time, because of money, lack of resources, transportation," Shore said. Even so, "the eclipse is going to be just as magical for them." As with all solar eclipses, researchers warn the public not to look directly at the sun and to never look at the sun through binoculars or telescopes without proper safety filters. Focused sunlight from even small binoculars can trigger near instant, permanent eye damage. More than 5,000 libraries across the nation plan to hand out cardboard-mounted solar filters and numerous websites carry instructions for building "pinhole" projectors, using holes punched in cardboard boxes or sheets of heavy paper to project an image of the sun on the ground or a paper/cardboard screen. For the millions in the path of totality, the relatively narrow strip where the moon will completely block out the sun, the sky will resemble deep twilight in the middle of the day. The temperature will drop and animals will be briefly confused. The duration of totality will vary from point to point, but it will be maximum -- about two minutes and 40 seconds -- near the border of western Kentucky and Illinois. NASA will study the eclipse using 11 spacecraft, including two operated by the National Oceanic and Atmospheric Administration, at least three research aircraft and more than 50 high-altitude balloons, broadcasting live coast-to-coast coverage on the agency's satellite TV channel. Hundreds of observatories are expected to monitor the eclipse, which gives scientists a unique opportunity to study the sun's outer atmosphere, or corona, the mysteriously super-heated region responsible for accelerating the charged particles making up the solar wind. The crew of the International Space Station will pass above central Canada during the eclipse and will photograph the sun from the lab complex. From their perspective 250 miles up, the moon will block out about 41 percent of the sun and its shadow may be visible on the station's southern horizon. Thomas Zurbuchen, NASA's director of space science, said the eclipse will provide a unique opportunity to study the sun, "the rosetta stone of all stars. What we learn about stars we first learn here at the sun." "So the eclipse is important because these bodies come into alignment in a cosmic moment that we're all part of," he said. "These cosmic moments, when nature speaks to us in an emotional way, sometimes come loud like thunderstorms, like hurricanes, earthquakes. But this one will be silent. All of the sudden, day will turn into night and back again, and the world around us, animals, will react to it. This emotion is really important."